A returning Broncos storms up the list after a blockbusting return, while our leader puts in another great performance. All that and more in our Round 5 Rookie Rankings. 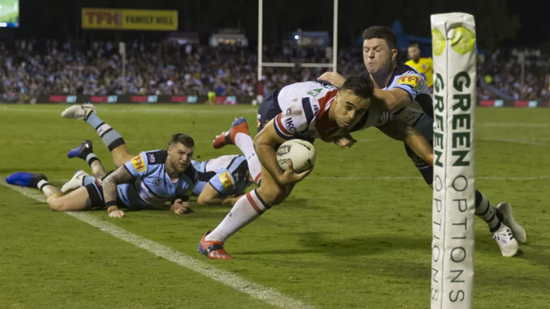 Sharks’ second rower Briton Nikora continues to not look anything like a rookie after another great performance in his side’s loss to the Roosters. Playing the full 80 minutes once again, Nikora ran for 160 metres and made two line breaks, breaking five tackles along the way. One of those line breaks would have resulted in a Sharks’ try shortly after half time but his pass to a team mate was knocked on. Parramatta failed to score in their loss to Canberra but winger Maika Sivo still did his job admirably. The Fijian ran for 130 metres from 15 runs and made two tackles, with one miss. Jack Williams started at lock again for Cronulla and got through a mountain of work in 49 minutes of action. He ran for 149 metres from 16 runs, broke two tackles and made 31 with just two misses. He topped off his performance with a late try. Payne Haas returned from his four week club imposed suspension with a bang, starting at lock and pumping out 64 minutes. The Keebra Park alum ran 17 times for 167 metres, 53 of those post contact. His defence was strong again, with 45 tackles and just two misses. A welcome return to the Broncos’ forward pack. It was a disappointing afternoon for Jayden Okunbor and his Bulldogs, who were thrashed by the Dragons at Kogarah. While he couldn’t quite hit the mark of his first two games, he still ran for 132 metres and broke two tackles. Three missed tackles and three errors will leave something for Okunbor to work on as he moves forward. Mikaele Ravalawa moves up a spot after scoring for the third straight game in the Dragons’ big win over the Bulldogs. Ravalawa has become a reliable contributor for his side, averaging 136.5 metres per game. In Round 5, he ran for 139 metres, breaking one tackle. Roosters’ winger Matt Ikuvalu cracks the top 10 for the first time after another solid performance for the reigning premiers. The highlight was his diving try in the corner, where, somehow, he managed to keep his body in the field of play and place the ball centimetres from the sideline. Fox Sports commentator Greg Alexander called it the best finish he’d ever seen. Broncos’ bench prop Thomas Flegler put in another solid shift in his side’s loss to the Tigers. In 27 minutes, he ran for 70 metres and made 18 tackles without miss. While known for his strong running, Flegler has been just as impressive defensively. In five games, he’s missed just two tackles for a 93.4% efficiency. Reuben Garricks jumps into the top 10 for the first time on the back of a very solid run of form for Manly. Averaging 107 metres per game, Garrick scored his second NRL try in the Sea Eagles’ win over Newcastle, adding 115 metres and four tackle breaks. Marion Seve has proven to be a reliable option for Storm coach Craig Bellamy after putting in another solid performance in their win over the Cowboys. Running for 67 metres and breaking four tackles, Seve’s defence might be the highlight. He’s yet to miss a tackle in four NRL games. Cronulla’s Bronson Xerri moves out of the top 10 due to a rough night with his hands, making four errors. He still ran for 114 metres and made 15 tackles, making a return to our rankings seem not too far away. Manly backrower Corey Waddell is very close to a top 10 appearance after running for 96 metres and making 27 tackles off the bench in his side’s win over Newcastle. Gold Coast prop Jai Whitbread returned to first grade in Round 5 and may stay there after a 93 metre and 23 tackle performance off the bench in their win over Penrith. Another returner to first grade was Tigers’ prop Thomas Mikaele, who ran for 44 metres and made five tackles without miss in 10 minutes. An injury to Blake Green in the warm-up meant Chanel Harris-Tavita was the only half on the field for the Warriors in their loss to South Sydney. He did admirably, setting up a try, kicking for 192 metres and making 17 tackles without a miss. Drop outs: Eels’ five-eighth Dylan Brown makes way this week after missing the last two rounds due injury, while Raiders’ forward Corey Horsburgh drops out after playing Canterbury Cup in Round 5. The 18th Man’s Rookie Rankings, released after each round, take into account a player’s previous round performance and their season as a whole. 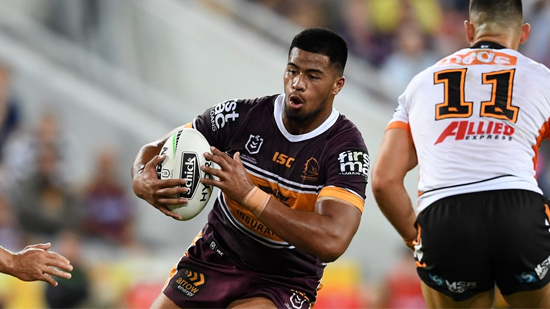 We are using the NRL’s criteria for Dally M Rookie of the Year; the player must not have played more than four NRL games prior to the current season to qualify. Unlike the NRL, a player won’t be taken off the rankings if he becomes ineligible through suspension.